I was born in 1954, and have lived in several places in Norway. In my youth I lived in Kristiansand, but I moved to Oslo, where I also lived for several years in my childhood, in 1978. I have lived in Drøbak since mid 80`s. I’m an educated kindergarten teacher (1976 -1978) at what was then called Sørlandets Kindergarten Learning School (now part of UiA). 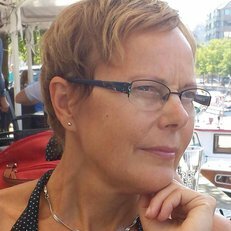 I worked for many years in various kindergartens in Oslo and Follo District, and for a few years I was also a teacher in a small hamlet school in Frogn. However, because of health reasons, I had to quit working as a kindergarten and school teacher. At twelve I got my first simple camera, and since then I have been a keen amateur photographer. Seeing humans, animals and nature through a photo lens has caused me to see the light in a new way; how everything changes in terms of how much, what kind of light it is and where it comes from. Arts and Crafts have always been part of my life, and earlier I especially loved drawing. In recent years, since I started on Nydalen Art School in 2007, however, the paint has become more and more central to my life. After I started painting, I have become increasingly concerned about what light means to us, also mentally: what it does to us and everything that surrounds us. It gets the dark/ the evil to disappear, and leaves room for improvement both for soul and body. This I try to transmit when I paint. The light has become my symbol of hope.